Patrick Donovan is a Technology Integration Specialist at Ames High School in Ames, IA. Patrick has been in education since 2004 and has taught secondary science before moving into the role of a technology coach. 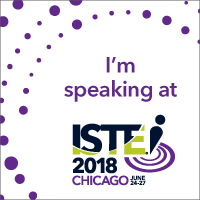 Patrick has presented at conferences across the Midwest and has presented multiple times at ISTE. He believes that technology should not be the focus of our learning but is the tool that we can use to get to the levels of teaching and learning that we desire. Patrick is part of the Friendly Disruption podcast and is an advocate for making learning accessible for all. I am currently a Technology Integration Specialist in Ames, IA at Ames High School and have been in this role since 2013. I graduated from ISU with a degree in Physics and Secondary Education in the spring of 2004. I received my Masters of Education in Curriculum and Instruction Technology in May of 2015. I taught for 3 years at Jefferson High School in Cedar Rapids, IA teaching Physics, Astronomy, Principles of Technology and Environmental Science. I then taught for 5 years at South Hamilton High School in Jewell, IA teaching Physics, Earth Science, Global Science, Principles of Engineering (PLTW class), and Horticulture. In 2012 I started teaching here in the Ames Community School District teaching Physics at the High School while also teaching 7th grade Life Science and 8th grade Physical Science at the Middle School. I am a certified Google Education Trainer and a certified Google Education Innovator. 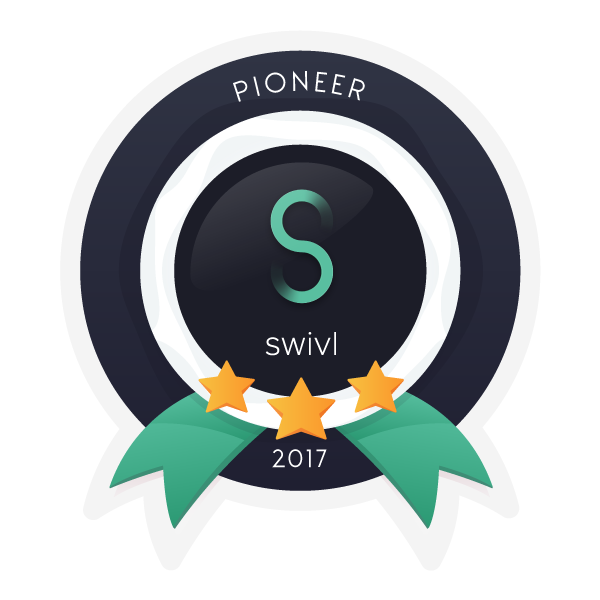 I am also a Swivl Video Pioneer. I have taught an 1 credit course at Iowa State University for the College of Education students titled: Social Media for Educators in Spring 2017 and Spring 2018. I am active as an educator on Twitter and believe that Twitter can be a very powerful way for teachers to take part in their own professional development. I have connected and shared ideas with teachers from all over the world as well as professionals in the field of science and technology. I love to see different ideas and methods that people have and how they relate to me and my students. I enjoy being able to pose a question and having people from all around the country being able to give input. I do not just use Twitter for professional work though as I also follow anything having to do with the Iowa State Cyclones and the Minnesota Vikings. I have also won a few things through Twitter contests which is another positive. My main educational philosophy revolves around the needs of our learners today. We can not teach how we have taught in the past because our students are not like the students of the past. We can not lecture and hope the students will absorb the information only to be spit out on the test. We need to help our students learn how to learn, how to collaborate and how to create. They need to be able to use and create with the content in our classrooms instead of just memorizing dates and facts that have no part in the big picture. If I can look up that fact in 2 seconds using Google, then why is it important to memorize? I believe that standards based grading and assessment can play a huge role in how we change our classrooms. I believe that a mastery style system can be very effective in making sure our students are actually learning and not just doing enough to “get by”. I also believe the flipped classroom can be a very effective technique for many teachers, but not all teachers. Finally, I believe that there is no “one way” to teach and that every classroom will (and should) look different because the teachers and students are not all the same. It is important for each teacher to figure out what is the best way for them to be able to help their students. Donovan, P. Making Learning Accessible for All. Presented at the International Society for Technology in Education (ISTE) Conference. Chicago, IL. June 2018. Donovan, P. Do More With Sheets – Become a Sheets Wizard. Presented at the International Society for Technology in Education (ISTE) Conference. San Antonio, TX. June 2017. 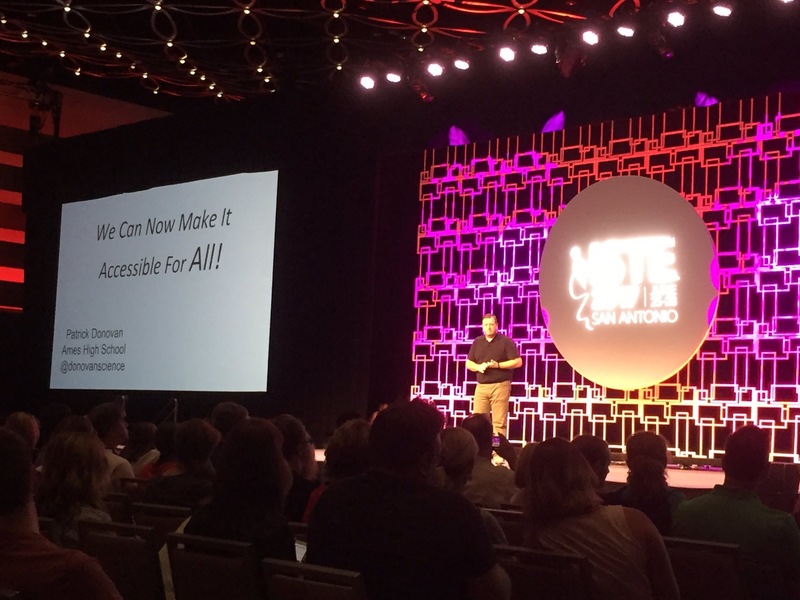 Donovan, P. ISTE Ignite – We Can Now Make It Accessible for All. Presented at the International Society for Technology in Education (ISTE) Conference. San Antonio, TX. June 2017. Donovan, P. Challenges and Badges (Gamification) for Teacher Learning. Presented at the International Society for Technology in Education (ISTE) Conference. San Antonio, TX. June 2017. Donovan, P. Challenges and Badges (Gamification) for Teacher Learning. Presented at the Midwest Google Summit, Lake Delton, WI. November 2016. Donovan, P. Challenges and Badges (Gamification) for Teacher Learning. Presented at the International Society for Technology in Education (ISTE) Conference. Denver, CO. June 2016. Donovan, P. Making Learning Accessible for All. Presented at the Iowa 1 to 1 Conference. Des Moines, IA. April 2018. Donovan, P. Making Learning Accessible for All. Presented at the ITEC Conference. Des Moines, IA. October 2018. Donovan, P. Do More With Sheets – Become a Sheets Wizard. Presented at the ITEC Conference. Des Moines, IA. October 2018. Donovan, P. Making Learning Accessible for All. Presented at the Technology and Information Educational Services (TIES) 2014 Education Technology Conference. Minneapolis, MN. December 2014. Donovan, P. Challenges and Badges (Gamification) for Teacher Learning. Presented at the Nebraska Educational Technology Association (NETA) Conference. Omaha, NE. April 2017. Donovan, P. Better Feedback Using Digital Tools. Presented at the Iowa 1:1 Conference. Des Moines, IA. April 2017. Donovan, P. Better Feedback Using Digital Tools. Presented at the Iowa Technology and Education Connection (ITEC) Conference. Des Moines, IA. October 2017. Donovan, P. Video as a Powerful Tool. Presented at the Iowa Technology and Education Connection (ITEC) Conference. Des Moines, IA. October 2017. Donovan, P. Making Learning Accessible for All. Presented at the Iowa Technology and Education Connection (ITEC) Conference. Des Moines, IA. October 2017. Donovan, P. Do More With Your Google Sheets. Presented at the Iowa Technology and Education Connection (ITEC) Conference. Des Moines, IA. October 2016. Donovan, P. Challenges and Badges (Gamification) for Teacher Learning. Presented at the Iowa Technology and Education Connection (ITEC) Conference. Des Moines, IA. October 2016. Donovan, P. Better Feedback Using Digital Tools. Presented at the Iowa Council of Teachers of English (ICTE) Conference. Johnston, IA. October 2016. Donovan, P. Moving Video Away From a Passive Learning Activity. Presented at the Nebraska Educational Technology Association (NETA) Conference. Omaha, NE. April 2016. Donovan, P. Moving Video Away From a Passive Learning Activity. Presented at the Iowa 1:1 Conference. Des Moines, IA. April 2016. Donovan, P. Moving Beyond the Textbook. Presented at the Iowa Technology and Education Connection (ITEC) Conference. Des Moines, IA. October 2015. Donovan, P. Moving Video Away From a Passive Learning Activity. Presented at the Iowa Technology and Education Connection (ITEC) Conference. Des Moines, IA. October 2015. Donovan, P. Collaboration Using Digital Tools. Presented at the Iowa Council of Teachers of English (ICTE) Conference. Johnston, IA. October 2015. Donovan, P. Better Feedback Using Digital Tools. Presented at the Nebraska Educational Technology Association (NETA) Conference. Omaha, NE. April 2015. Donovan, P. Better Feedback Using Digital Tools. Presented at the Iowa 1:1 Conference. Des Moines, IA. April 2015. Donovan, P. Google Apps for Education for Differentiation. Presented at the Technology and Information Educational Services (TIES) 2014 Education Technology Conference. Minneapolis, MN. December 2014. Donovan, P. Google Apps for Education for Differentiation. Presented at the Iowa Technology and Education Connection (ITEC) Conference. Des Moines, IA. October 2014. Donovan, P. Digital Tools for Administrators. Presented at the Iowa Technology and Education Connection (ITEC) Conference. Des Moines, IA. October 2014. Donovan, P. Better Feedback Using Digital Tools. Presented at the Iowa Council of Teachers of English (ICTE) Conference. Johnston, IA. October 2014. Donovan, P. Flipped Professional Development. Presented at the Iowa 1:1 Conference. Des Moines, IA. April 2014. Donovan, P. Managing Workflow in Google Apps Using Doctopus and Other Methods. Presented at the Iowa 1:1 Conference. Des Moines, IA. April 2014. Donovan, P. The Flipped Classroom with Standards Based Grading and Mastery. Presented at the Iowa Technology and Education Connection (ITEC) Conference. Des Moines, IA. October 2011. Donovan, P. Using Digital Tools in the Science Classroom. Presented at the Iowa Science Teachers Section (ISTS) Conference. Ames, IA. October 2011. Donovan, P. The Flipped Classroom with Standards Based Grading and Mastery. Presented at the Iowa 1:1 Conference. Des Moines, IA. April 2011. All posts and content on this site are free to use and share. Citations are always welcomed.